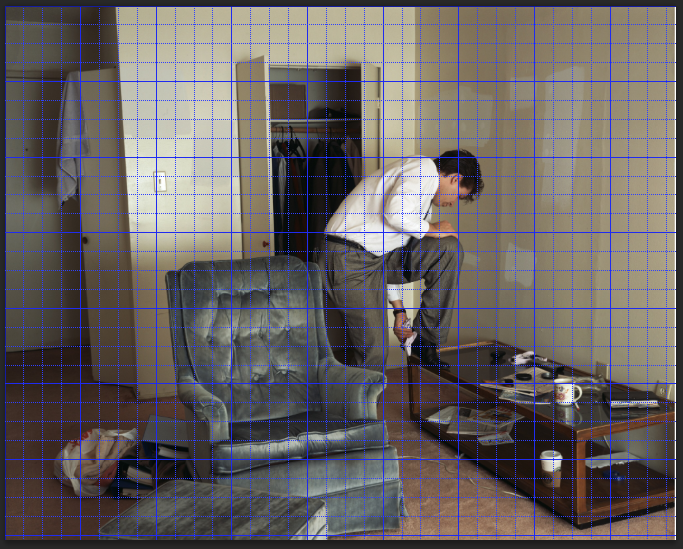 Jeff Wall‘s display lightboxes contain some weird perspective. The celebrated Canadian is showing at NGV at Melbourne’s Fed Square (till March 17, 2013). I regret was not well enough to attend the Forum in the Great Hall Wednesday 28 November and it is a measure of the NGV that they had both Thomas Demand 1 (showing at NGV International) and Jeff Wall in the same room to talk to an Australian audience. “I don’t think my pictures look very good in books, but still, the better the book, the better they look—or the less they seem inadequate. They are made to be a certain size and scale and that can never be captured on a page.”. On several occasions he refers to this proportion as ‘life-scale’ (but not ‘life-size’), which is of course a somewhat elastic measure in reference to any photograph; the foreground being of one ‘scale’ while the background is diminished. Something odd does happen here in our encounters with such huge lightboxes. Look at Polishing (1989) for example, in which a young salesman polishes the heel of his shoe in a (decidedly down-at-heel) motel-room. Cleaning and ickiness, tidiness and chaos are polar obsessions of notoriously meticulous Wall. The bending figure is the same scale as figures of the audience looking at it, and slightly smaller than the man in the neighbouring Doorpusher (made 14 years before) who bends in the opposite direction. There is a perceptual discomfort in viewing this image on the wall that is not apparent in the desk-top experience of it. I’m referring to a weird skewing of the perspective of the room. Wall has tilted the monorail of his 8×10 camera down toward the corner of the room, making the left hand wall of the bathroom lean uncomfortably, more than does the patched join of the wall panels to the right. He has then shifted the lens left, thus positioning the one vertical (right behind the figure) to the right of centre. The bathroom door, draped with a towel, looks as if it is hanging off its hinges, at variance with the top of the entrance door which remains horizontal. Conventionally, an architectural photographer would square everything and Wall does that in Doorpusher which though shot from an extremely oblique angle employs a radical drop-front to correct the verticals. Wall conditions our awareness of this particular space. He did much earlier and less subtly in The Destroyed Room 1978 by allowing us glimpses through door and window of the warehouse studio housing the set. The disturbing effect of perspective in his works, is not unlike that we experience in front of Mantegna’s The Lamentation of Christ c. 1480. It is due only in part to their scale. The neighbouring work Diagonal Composition 1993, opposite in this section of the exhibition, is one of a series become modellos for this, all titled Diagonal Composition (though only Diagonal Composition No.2 is contemporaneous with Polishing). They are shape-shifting tricks replete with the deliberately zig-zag perspectives, faux textures and even the colours beloved of Juan Gris and fellow Cubists. This and other ‘footnotes’ in this space help account for my vertigo in viewing Polishing and other works in this exhibition. 1 Of Thomas Demand, more in a later post, but I have one puzzlement; why do Demand’s images come up looking so much more vivid than Wall’s when the latter’s images are transparencies on light boxes? It is a painstakingly designed show. Did the artist stipulate that technicians ramp up the ambient light to almost the same luminance as the output of the lightboxes? Or was it an OH&S concern? The result is some sad muddied blacks in most images. I remember by contrast my first startling encounter with a Wall lightbox in a darkened room at the Jeu de Paume in the 90s. Maybe during my NGV visit this was just the influence of daylight (bright overcast that day) that infiltrates some of the spaces – over on Marcus Bunyan’s artblart you will find very juicy installation shots which are quite different from my experience. ← X-Ray Vision, or Concentration? A wonderful analysis of the Jeff Wall. Would you mind if I used your gridded image and text with accreditation in my review of the exhibition that I have yet to write. Link back to your blog as well! Thank you so much for your comments, and yes of course, go ahead and use the gridded image. Thank you for your blog, which along with Greg Neville’s has inspired me to so belatedly take up blogging. I admire your thoroughness and evenhandedness. I look forward to your review there of Wall’s show. I really don’t like the join across the photographs. With what he sets out to achieve vis a vis the creation of these simulated, spatial hyper-narratives you would think that there would be the technology to be able to construct the images without them. For me, this becomes a metaphor for the spaces and narratives within his images falling apart. They are very planar as you point out and I just don’t believe them. Take away the light box element as per one of the rooms of the exhibition and the prints fall as flat as a pancake. I wrote in order to leave judgement to the individual viewer. As a lecturer at Prahran College in the early 80s though, I was intrigued by what I took to be real nerve in Wall’s works like An Eviction at a time when ‘documentary’ photography was going through a crisis – something Carol Jerrems’ Vale Street was confronting, as she would continue to do up to her untimely death – and as Jo Spence was doing in a more extrovert manner. Wall’s power in that regard has now gone, I agree, but my angle here is on the formalism that remains, empty of connection to the subject – Wall now denies any narrative (as he does in discussing Knife Thrower with Isobel in the NGV video interview) – but it was undeniably there writ large in An Eviction and the video rehearsals that surround it.